My friend Amy Abattoir owns this necklace. 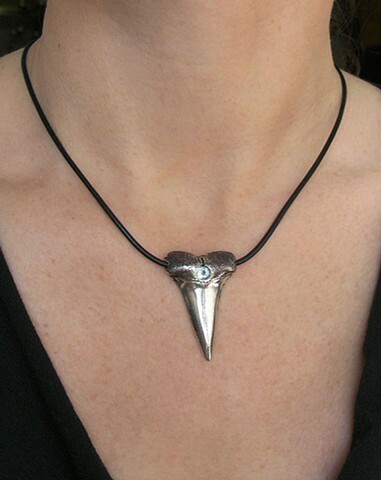 A large shark tooth is cast in solid sterling silver and set with a glimmering 5mm aquamarine. The tooth is hung on a 16" black leather cord with sterling silver clasp. The original tooth from which the silver tooth was molded and cast is a prehistoric, fossilized shark tooth found washed ashore in Spain. It has a wonderful symmetry and weight. Tooth measures approx. 1.5" x 1".